In order to install SEO extension on your store, you can learn and do it by yourself via Installation Guide or use Installation Service Package to request the specialist helps from Mageplaza Team. Choose Enable = “Yes” to turn Mageplaza SEO on generally. Filtering results (from layered navigation pages, etc) is the main cause of generating many similar URLs, and search crawlers assess them are all the same, in other words, it’s called duplicate content. Therefore, you must have the assist from Canonical tags to reduce the duplication of content on the page, this is an onpage SEO tip to note obviously. In the Use Canonical Link Meta Tag For Categories field: Choose “Yes” to display Canonical tags of Category pages which are from Source Category on the frontend. In the Use Canonical Link Meta Tag For Products field: Choose “Yes” to display Canonical tags of Source Product on the frontend. Select “Yes” to display the basic information of products when they are searched by search engines. By this intuitive design, Product Structured Data will increase click through rate (CTR) drastically. Thus, products from your store will be ranked higher on search results. You can check Product Structure Data at the Page Source of Product Detail Page. Structure Data will mirror exactly as the basic information of that product. Select “Yes” to display your store’s Searchbox on the Sitelinks. As soon as your store displays on the search results, your store searchbox will also display with the store’s link. You can test the code in Page Source of Homepage. In the Enable Bussiness Information field: Select “Yes to display information about your business in the search result. 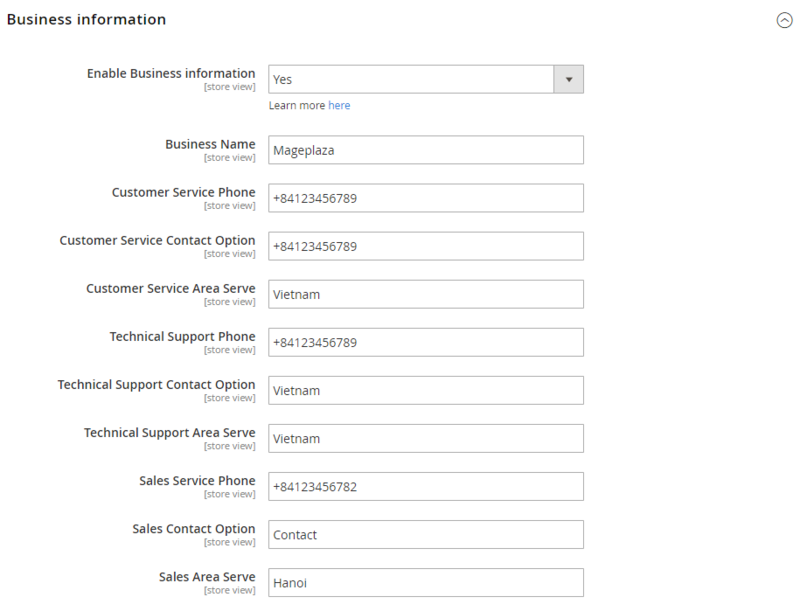 When you leave any field blank, the information for that field will not display. You can paste your social addresses in here. Make sure that all the accounts have been verified. Social Profile will display along with Business Information. 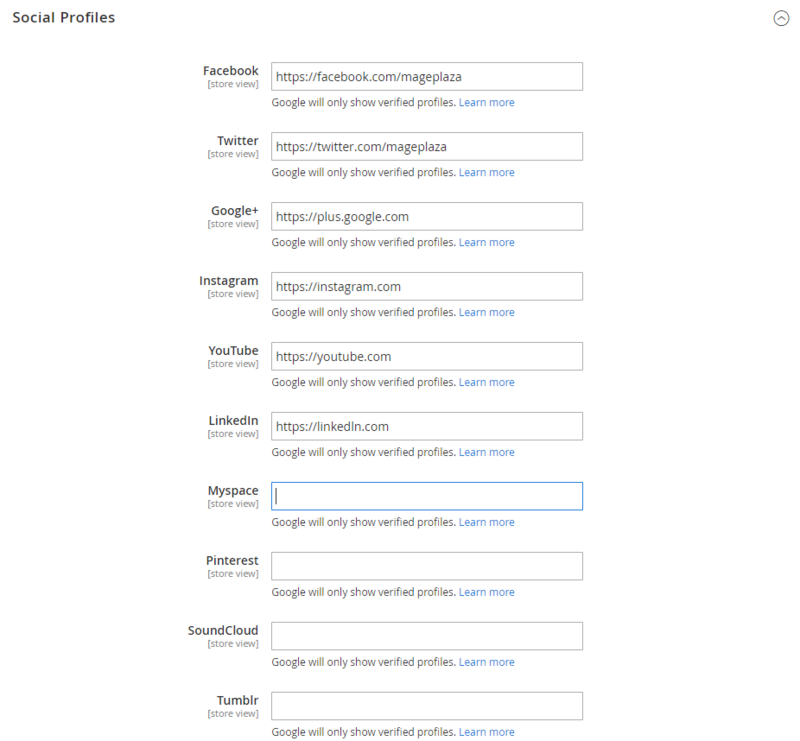 If Business Information is not enabled, Social Profile won’t display in search results. You can leave unnecessary Social Profiles in blank status. When the searcher clicks on one of your social links, they will be redirected to that social page of your store. In the Verification field, you need to enter the verification code to confirm the ownership of your site. Hence, you can use the Web services such as Google Search Console, Bing Webmaster Tools, Pinterest and Yandex Webmaster Tools. In the Google Search Console field: Enter the verification code for Google Search Console. In the Bing Webmaster Tools field: Enter the verification code for Bing Webmaster Tools. In the Pinterest field: Enter the verification code for Pinterest. In the Yandex Webmaster Tools field: Enter the verification code for Yandex Webmaster Tools. This add-on tool will assist SEO extension in assessing and marking which and how to perform the structured data at the best for SEO progress. You can have a general review for the SEO analysis at the Product Page, Category Page and CMS Page. Go to Product > Catalog, choose Edit a random one. The page will be directed to SEO Tool page for the check execution. After the checking done, SEO Tool will show assessed results of that product page’s SEO. There’re some fundamental standards are built from our intuitive knowledge so feel free to knock us a word if you want to discuss further regarding this issue. Apply the same action with Category Page and CMS Page.